Sarracenia pitchers are actually modified leaves that lure, trap and consume a wide variety of prey including: flies, ants, beetles and wasps. They are particularly effective at catching Stink Bugs. Sarracenia have prominent, decorative trap leaves that are basically tubular and usually topped with a hood. Pitcher plants have evolved several interesting methods to trap prey. Bright coloring and the secretion of nectar lure prey to the pitcher opening. The nectar is often intoxicating and disorients the insect. The slick upper inner lining of the tube causes most insects to fall into the trap. There, stiff downward pointing hairs allow the prey to make a one-way journey deeper into the ever narrowing tube. In some species digestive glands secret enzymes which digest the prey. In other species bacterial action breaks down the victim. In either case, the prey is digested and its nutrients are absorbed. The foul smell of the decomposing prey may be helpful in luring other prey. The digestive fluids do not digest all creatures. Some protozoa and insect larvae can survive and even breed within the traps. The inside of a living pitcher plant can be a complex little ecosystem of algae, fungi, bacteria, protozoa, and various resistant insect larva, including some species of mosquitoes, flies and moths. Sarracenia flowers are globular, 5-petaled, and hang upside down. Their color ranges from pale yellow/white to custard, orange, red and maroon. Flowering is in the early spring before the traps emerge. Flowers typically have a slight fragrance. The flower will commonly turn upright as seeds develop. Petals last for about a month, but the sepal remain all season, and resemble green/red daffodils. 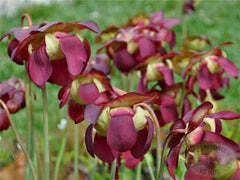 Sarracenia are generally resistant to most pests. Watch out for aphids in early spring and fall, and scale and mealy bugs near and under the trap folds and rhizome. Pest can be removed manually or treated with a dilute systemic general insecticide. The Genus name Sarracenia honors Dr. Michael Sarrasin de l’Etang of Quebec who reportedly sent the first pitcher plants to Europe around 1700. Sarracenia purpurea is the provincial flower of Newfoundland and Nova Scotia, Canada.